UNIVERSE offers foreign language support in any media, including audio and video presentations, slides, complete graphic production, 35 mm films, subtitling, full color printing, etc. 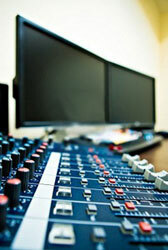 UNIVERSE can deliver film dubbing, voice over, CD-ROM production - all in digital or analog format. Our narration services include a choice of male/female voice-overs, as well as a choice of studio.